What is a Battle Rifle? As gun enthusiasts, most of us are probably familiar to some extent with the term battle rifle. While at first it might seem as though that term would refer to any rifle used in combat, it actually has pretty narrow definition in common parlance. Battle rifles are autoloading rifles firing so-called “full-power” ammunition, such as .308 Winchester, and utilizing detachable magazines. 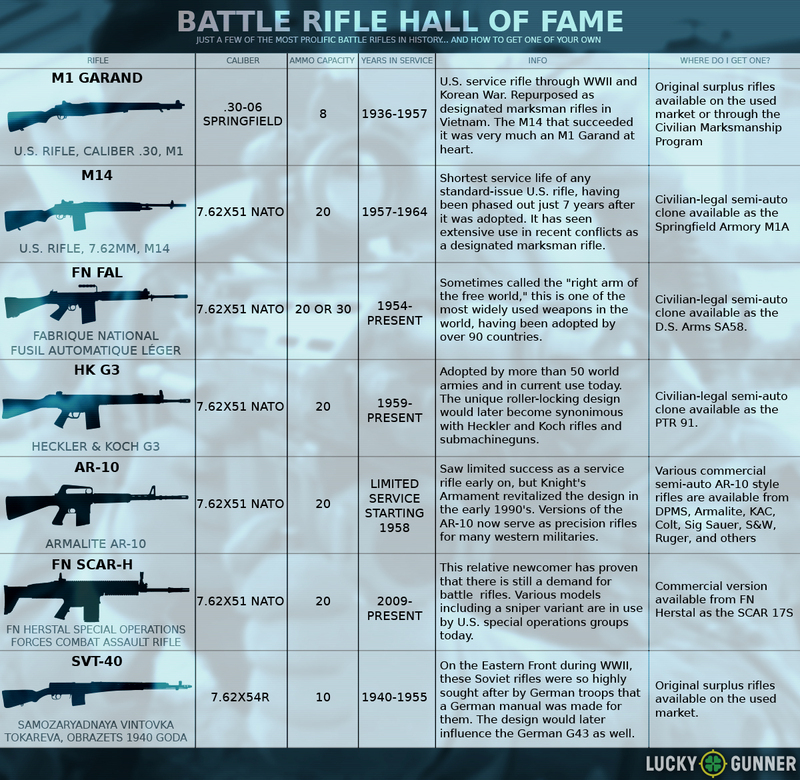 The most famous battle rifles are the M14, FAL, and the G3, but there are many others. For me, the battle rifle has always been an artifact of small arms design which marks the point where modern firearms development fell just short of understanding modern warfare. The battle rifle was often too much gun in practical applications, and yet, just as modern militaries had seen the light of the intermediate cartridges like 5.56 and 7.62x39mm, they also realized that they might just have had the right tool at the wrong time. While most battle rifles are post WWII designs, the first saw combat in World War I. The famous 1918 BAR was technically America’s first battle rifle, if we are going strictly by design criteria and ignore the weapon’s intended role. Still, the real dawn of the battle rifle was World War II. The United States, Germany and Russia all had full power, semi-auto rifles in the hands of their troops. To be fair, the M1 Garand didn’t use a detachable magazine, and the Soviet SVT-40 and German G41 mainly used stripper clips for loading, but these guns were certainly the forerunners of modern battle rifles. 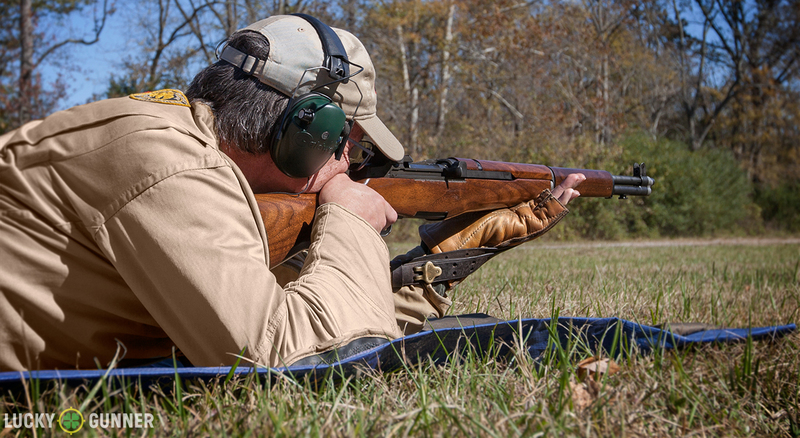 A Project Appleseed participant firing a vintage M1 Garand at 300 yards. So what was the problem? 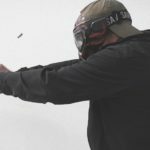 Well, we were still pretty excited about what smokeless powder allowed us to do with firearms, and that desire to push the limits of weapon capability eventually collided head-on with the realities of still-evolving modern warfare. Since the late 19th century, small arms design was focused on making guns that could shoot faster and at longer ranges than the rifles before them. Metallic cartridges allowed us to make reliable repeaters, and smokeless powder allowed us to shoot farther than we could before. Ever wonder why the World War I and World War II era rifles typically had iron sights that could adjust out to 2,000 meters? It was wishful thinking that came out of experiences and frustrations from previous wars where the enemy might well be seen on a distant hillside and yet out of range of the individual small arms. The old idea of “don’t fire until you see the whites of their eyes” was replaced with volley sights that were supposed to allow rifle companies to concentrate fire on enemy positions at distances that even modern snipers very rarely touch. After World War II, many countries began developing new weapon designs to address the shortcomings of the weapons they fielded before. It was clear that autoloading rifles were the new status quo and during the 1950’s many of the designs we know and love today were born. 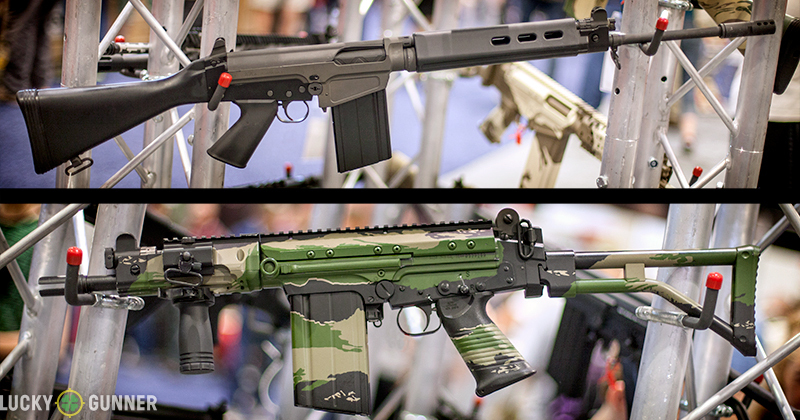 DS Arms makes a variety of FAL-inspired battle rifles. Some are very faithful to the original design (top), while others deviate dramatically like this camo-pattern SBR version (bottom). The U.S. chose the M14, which was an evolution of the beloved M1 Garand. Much of the rest of the western world adopted either the FAL or the G3. These rifles had all the punch of the weapons they replaced, plus the added rate of fire that came with detachable magazines and full-auto capability. The M1 Garand was called “the greatest battle implement ever devised” by General Patton, and yet these new battle rifles could fire just as far, and fire much faster. Surely we had reached the pinnacle of small arms design by this point, right? The U.S. would soon reevaluate almost everything we thought we knew about warfare during the war in Vietnam. The dense jungles stripped away every advantage the M14 was designed to have. The long barrel got caught on vegetation and the wood stocks cracked from humidity. 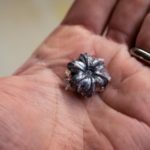 The gun was uncontrollable in full-auto, and the .308 rounds were simply overkill for firefights stretched over just a few hundred yards. The M16 was introduced and despite the initial teething problems in Vietnam, it signaled the beginning of an international shift in terms of what was needed in a service rifle. Meanwhile, the Soviets had seen the writing on the wall decades prior, and the AK-47 was proof positive that smaller caliber assault rifles were the future. So where does that leave the battle rifle today? Well, we’re actually seeing a sort of resurgence of the battle rifle concept. Part of it has to do with recent military conflicts and the need for designated marksman rifles, but the growing civilian market and the recent strides in the advancement of the AR-10 design have also played a large part. In the end, there are just some things the .308 can do that the 5.56 never will, and chief among those is the ability to shoot farther. 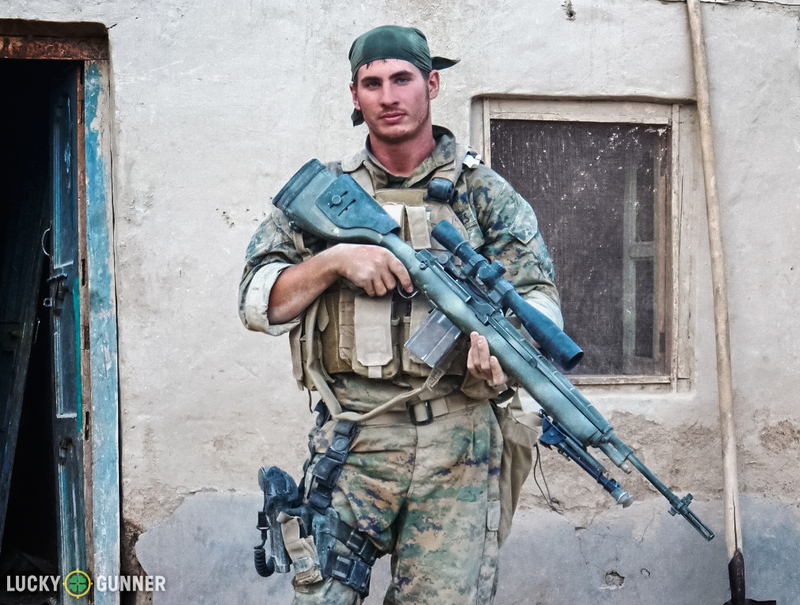 The author with a re-purposed M-14 designated marksman rifle while serving in Afghanistan. Currently, most battle rifles in use by the U.S. military exist as designated marksman rifles. These are meant to bridge the gap between precision bolt-action sniper rifles and the general issue assault rifle. Match grade barrels and high-power optics allow for accurate long range fire, while the 20 round magazines and semi-auto action make it capable of suppression and room entry if necessary. The added punch of the .308 round certainly helps too. The designated marksman rifle concept is very near and dear to my heart because I got my first hands-on experiences with battle rifles as a designated marksman in Afghanistan. There, it was common practice for Taliban fighters to engage U.S. forces from 600-800 yards away, well past the effective range of the M4 carbines carried by most troops. Fortunately, many units like mine were able to utilize battle rifles in the form of accurized Vietnam-era M14s or AR-10 based rifles. These rifles provided individual squads with the ability to return fire accurately and effectively over extended ranges without each individual having to carry a rifle and ammo that was often heavier and bulkier than necessary. The battle rifle will continue to serve for quite some time in this important, yet somewhat limited, role. Oddly enough, while the battle rifle now serves a fairly specific role in today’s militaries, it is probably the best choice for a civilian shooter wanting absolute versatility from a single rifle. The .308 round is available in a vast number of different loads and is capable of taking any game in North America. 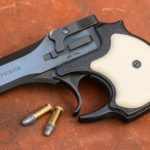 The semi-auto action allows for quick follow up shots in the event of a miss, or the ability to quickly and humanely administer a second shot to a wounded animal. The battle rifle can run in fast-paced 3-gun competitions, and then turn around and shoot long range disciplines depending on its specific configuration. The same disadvantages compared to smaller caliber rifles will still exist, such as the heavier weight, more expensive ammo, and harsher recoil, but battle rifles can make up for this in sheer range of application. With the recent explosion of AR-10 rifles, parts and rifle accessories available, it’s entirely possible to have one lower receiver and a few different uppers to cover all of your rifle shooting needs from hallway distances all the way out to 1,000 yards. Even the fact that battle rifles have been largely abandoned by militaries is a boon to civilian shooters who enjoy having plentiful and cheap spare parts and magazines. While battle rifles seemed to have missed their heyday in terms of frontline service, they continue to serve as versatile and useful tools for military and civilian shooters alike. Based on today’s AR-10 market, I think it’s safe to say that these battlefield big-shot rifles may have gotten their second wind.